April chased dad and I through a fenced park today while we threw the football and jogged. She enjoyed the grass and open spaces and is faster than you might think. In the afternoon we found a lizard which she pranced around with for a while. 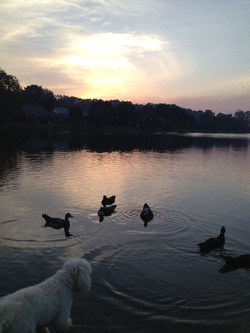 We watched the sunset at the pond until some ducks swam up to say hi. April was so excited to meet them that she jumped in and swam...twice! It was a great day...for some. Don crushed the lizard underfoot. Mickie's day was ruined because the dog got wet.